The Strait of Juan de Fuca is the wide waterway stretching from the Pacific Ocean on the west to the San Juan Islands on the east, with Vancouver Island to the north and the Olympic Peninsula to the south. The Strait of Georgia lies north of the San Juans. 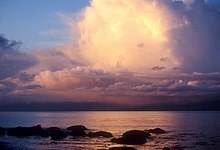 Puget Sound is the narrower waters south of the Strait of Juan de Fuca. The Strait of Juan de Fuca (officially named Juan de Fuca Strait in Canada) is a large body of water about 154 kilometres (96 mi) long that is the Salish Sea's outlet to the Pacific Ocean. The international boundary between Canada and the United States runs down the center of the Strait. It was named in 1787 by the maritime fur trader Charles William Barkley, captain of the Imperial Eagle, for Juan de Fuca, the Greek navigator who sailed in a Spanish expedition in 1592 to seek the fabled Strait of Anián. Barkley was the first non-indigenous person to find the strait, unless Juan de Fuca's story was true. The strait was explored in detail between 1789 and 1791 by Manuel Quimper, José María Narváez, Juan Carrasco, Gonzalo López de Haro, and Francisco de Eliza. The USGS defines the Strait of Juan de Fuca as a channel. It extends east from the Pacific Ocean between Vancouver Island, British Columbia, and the Olympic Peninsula, Washington, to Haro Strait, San Juan Channel, Rosario Strait, and Puget Sound. 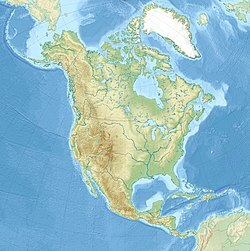 The Pacific Ocean boundary is formed by a line between Cape Flattery and Tatoosh Island, Washington, and Carmanah Point (Vancouver Island), British Columbia. 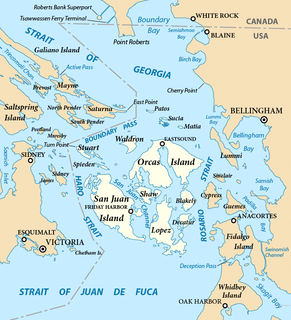 Its northern boundary follows the shoreline of Vancouver Island from Carmanah Point to Gonzales Point, then follows a continuous line east to Seabird Point (Discovery Island), British Columbia, Cattle Point (San Juan Island), Washington, Iceberg Point (Lopez Island), Point Colville (Lopez Island), and then to Rosario Head (Fidalgo Island). The eastern boundary runs south from Rosario Head across Deception Pass to Whidbey Island, then along the western coast of Whidbey Island to Point Partridge, then across Admiralty Inlet to Point Wilson (Quimper Peninsula). The northern coast of the Olympic Peninsula forms the southern boundary of the strait. In the eastern entrance to the Strait, the Race Rocks Archipelago is located in the high current zone halfway between Port Angeles, Washington, and Victoria, BC. Like the rest of the Salish Sea and surrounding regions, the climate of the Strait is disputed, with the Köppen system classifying it as Mediterranean, but most regional climatologists preferring oceanic. While the climate is mostly oceanic in nature, the dry summers result in the Mediterranean classification in the Köppen system. Rainfall ranges from over 2,500 millimetres (98 in) (temperate rainforest) conditions at the west end to as little as 410 millimetres (16 in) at the east end, near Sequim. Because it is exposed to the generally westerly winds and waves of the Pacific, seas and weather in Juan de Fuca Strait are, on average, rougher than in the more protected waters inland, thereby resulting in a number of small-craft advisories. An international vehicle ferry crosses the Strait from Port Angeles, Washington to Victoria, British Columbia several times each day, as do passenger ferries of the Washington State Ferry system, a seasonal private ferry connecting Port Angeles with Victoria, and a private high-speed ferry between Victoria and Seattle. This strait remains the subject of a maritime boundary dispute between Canada and the United States. The dispute is only over the seaward boundary extending 320 kilometres (200 mi) west from the mouth of the strait. The maritime boundary within the strait is not in dispute. Both governments have proposed a boundary based on the principle of equidistance, but with different basepoint selections, resulting in small differences in the line. Resolution of the issue should be simple, but has been hindered because it might influence other unresolved maritime boundary issues between Canada and the United States. In addition, the government of British Columbia has rejected both equidistant proposals, instead arguing that the Juan de Fuca submarine canyon is the appropriate "geomorphic and physiogeographic boundary". The proposed equidistant boundary currently marks the northern boundary of the Olympic Coast National Marine Sanctuary. British Columbia's position is based on the principle of natural prolongation which developed in international law. It poses a dilemma for the federal government of Canada. If Canada holds that the principle of natural prolongation applies to the Juan de Fuca Canyon on its Pacific Ocean coast, the assertion could undermine Canada's argument in the Gulf of Maine boundary dispute. In this Atlantic Ocean context, Canada favours an outcome based on the principle of equidistance. In March 2008, the Chemainus First Nation proposed renaming the strait the "Salish Sea", an idea that reportedly met with approval by British Columbia's Aboriginal Relations Minister Mike de Jong, who pledged to put it before the B.C. cabinet for discussion. Making Salish Sea official required a formal application to the Geographical Names Board of Canada. A parallel American movement promoting the name had a different definition, combining of the Strait of Juan de Fuca and Puget Sound as well as the Strait of Georgia and related waters under the more general name Salish Sea. This latter definition was made official in 2009 by geographic boards of Canada and the United States. In October 2009, the Washington State Board of Geographic Names approved the Salish Sea toponym, not to replace the names of the Strait of Georgia, Puget Sound, and Strait of Juan de Fuca, but instead as a collective term for all three. The British Columbia Geographical Names Office passed a resolution only recommending that the name be adopted by the Geographical Names Board of Canada, should its US counterpart approve the name-change. The United States Board on Geographic Names approved the name on November 12, 2009. Certain groups of seabirds called common murre migrate north by swimming. Some Pacific Coast murres paddle north to the sheltered bays of the Strait of Juan de Fuca to feed on herring and other small fish. Some scenes from the film The Hunt for Red October were filmed in the Strait of Juan de Fuca in 1989. ^ "Juan de Fuca Strait". BC Geographical Names. ^ While U.S. Geological Survey Geographic Names Information System: Strait of Juan de Fuca says John Meares named the strait in 1788, most sources say it was Barkley in 1787, for example: "Juan de Fuca Strait". BC Geographical Names. ; Existence of the Strait of Juan de Fuca confirmed by Captain Charles Barkley, Washington Secretary of State; Hayes, Derek (1999). Historical Atlas of the Pacific Northwest: Maps of exploration and Discovery. Sasquatch Books. p. 16. ISBN 1-57061-215-3. online at Google Books; and Pethick, Derek (1980). The Nootka Connection: Europe and the Northwest Coast 1790–1795. Vancouver: Douglas & McIntyre. p. 24. ISBN 0-88894-279-6. It is well established that Meares tried to take credit for much of Barkley's work. ^ "SEQUIM 2 E, WASHINGTON". ^ Charney, Jonathan I.; David A. Colson; Robert W. Smith (2005). International maritime boundaries. Martinus Nijhoff. p. 3403. ISBN 978-90-04-14461-3. ^ McRae, Donald Malcolm; Gordon Ross Munro (1989). Canadian Oceans Policy: National Strategies and the New Law of the Sea. UBC Press. pp. 151–152. ISBN 978-0-7748-0346-5. ^ Johnston, Douglas M.; Mark J. Valencia (1991). Pacific Ocean Boundary Problems: Status and Solutions. Martinus Nijhoff. p. 102. ISBN 978-0-7923-0862-1. ^ "Strait of Georgia could be renamed Salish Sea". Canadian Press. CBC.ca. 2008-03-09. Retrieved 2008-03-10. ^ Howard Macdonald Stewart, 2017. Views of the Salish Sea: One Hundred and Fifty Years of Change around the Strait of Georgia. Harbour Publishing Company Limited. pp. 13–15. ISBN 978-1-55017-804-3. ^ a b "STATE BOARD ON GEOGRAPHIC NAMES APPROVES 'SALISH SEA'". 2009-10-30. Archived from the original on 2013-10-30. ^ Berger, Knute (October 20, 2009). "Smooth Sailing for the Salish Sea?". Crosscut. Archived from the original on January 5, 2010. Retrieved August 13, 2011. ^ Berger, Knute (November 12, 2009). "U.S. approves Salish Sea name". Crosscut. Archived from the original on February 27, 2010. Retrieved August 13, 2011.
discoveryisland.ca – Discovery Island a small island in the Strait of Juan de Fuca off of Victoria BC Canada with a rich history From first nations to early settlers to present times. Puget Sound is a sound along the northwestern coast of the U.S. state of Washington, an inlet of the Pacific Ocean, and part of the Salish Sea. It is a complex estuarine system of interconnected marine waterways and basins, with one major and two minor connections to the open Pacific Ocean via the Strait of Juan de Fuca—Admiralty Inlet being the major connection and Deception Pass and Swinomish Channel being the minor. The Strait of Georgia or the Georgia Strait is an arm of the Pacific Ocean between Vancouver Island and the extreme southwestern mainland coast of British Columbia, Canada and the extreme northwestern mainland coast of Washington, United States. It is approximately 240 kilometres (150 mi) long and varies in width from 20 to 58 kilometres. Along with the Strait of Juan de Fuca and Puget Sound, it is a constituent part of the Salish Sea. Archipelagos and narrow channels mark each end of the Strait of Georgia, the Gulf Islands and San Juan Islands in the south, and the Discovery Islands in the north. The main channels to the south are Boundary Pass, Haro Strait and Rosario Strait, which connect the Strait of Georgia to the Strait of Juan de Fuca. In the north, Discovery Passage is the main channel connecting the Strait of Georgia to Johnstone Strait. The strait is a major navigation channel on the west coast of North America, owing to the presence of the port of Vancouver, and also due to its role as the southern entrance to the intracoastal route known as the Inside Passage. The Gulf Islands are the islands in the Strait of Georgia, between Vancouver Island and the mainland of British Columbia, Canada. The Inside Passage is a coastal route for ships and boats along a network of passages which weave through the islands on the Pacific NW coast of North America. The route extends from southeastern Alaska, in the United States, through western British Columbia, in Canada, to northwestern Washington state, in the United States. Ships using the route can avoid some of the bad weather in the open ocean and may visit some of the many isolated communities along the route. The Inside Passage is heavily travelled by cruise ships, freighters, tugs with tows, fishing craft and ships of the Alaska Marine Highway, BC Ferries, and Washington State Ferries systems. The British Columbia Coast or BC Coast is Canada's western continental coastline on the North Pacific Ocean. The usage is synonymous with the term West Coast of Canada. The Salish Sea is the intricate network of coastal waterways that includes the southwestern portion of the Canadian province of British Columbia and the northwestern portion of the U.S. state of Washington. Its major bodies of water are the Strait of Georgia, the Strait of Juan de Fuca, and Puget Sound. It reaches from Desolation Sound at the north end of the Strait of Georgia to Oakland Bay at the head of Hammersley Inlet at the south end of Puget Sound. 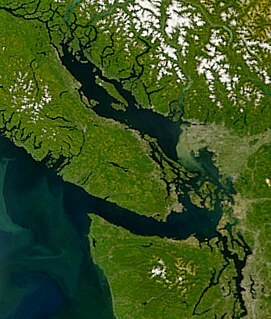 The inland waterways of the Salish Sea are partially separated from the open Pacific Ocean by Vancouver Island and the Olympic Peninsula, and are thus partially shielded from Pacific Ocean storms. Major port cities on the Salish Sea include Vancouver, Seattle, Tacoma, Bellingham, Port Angeles and Victoria. Much of the coast is part of a megalopolis stretching from West Vancouver, British Columbia, to Olympia, Washington. Rosario Strait is a strait in northern Washington state, separating San Juan County and Skagit and Whatcom Counties. It extends from the Strait of Juan de Fuca about 23 kilometres (14 mi) north to the Strait of Georgia. The USGS defines its southern boundary as a line extending from Point Colville on Lopez Island to Rosario Head on Fidalgo Island, and its northern boundary as a line from Point Migley on Lummi Island to the east tip of Puffin Island and then to Point Thompson on Orcas Island. Rosario Strait runs north-south between Lopez, Decatur, Blakely, and Orcas Islands on the west, and Fidalgo, Cypress, Sinclair, and Lummi Islands on the east. Haro Strait, often referred to as the Haro Straits because it is really a series of straits, is one of the main channels connecting the Strait of Georgia to the Strait of Juan de Fuca, separating Vancouver Island and the Gulf Islands in British Columbia, Canada from the San Juan Islands of Washington state in the United States. The Stz'uminus First Nation is a First Nations government located in southeastern Vancouver Island, British Columbia, Canada, near the town of Ladysmith, British Columbia. The Stz'uminus First Nation is a member government of the Naut'sa mawt Tribal Council. In early 2009, chief and council unanimously passed a band council resolution to officially change the name from Chemainus to Stz'uminus in order to reflect its original Hul'qumi'num language name. Carmanah Point Light Station is a lighthouse on the southwest coast of Vancouver Island at the entrance from the Pacific Ocean to the Strait of Juan de Fuca. Juan de Fuca Channel is a submarine channel off the shore of Washington state, USA and the Strait of Juan de Fuca.